Photo above: ©2012 Title: Handful. The 45-year-old Swedish artist Lena Olson graduated from the HDK School of Design and Crafts at Gothenburg University in 1996, and has had her own design studio in Gothenburg since then. 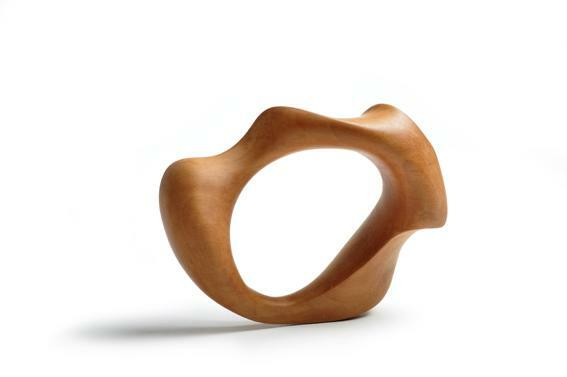 Her main activity is the design of wooden jewellery – in particular, bracelets, rings and pendants. The world of jewellery is in a state of rapid evolution nowadays. While precious metals such as gold, silver and platinum are still fetching high prices, many jewellery-makers are going for new, innovative designs and new materials. These developments actually date back to the 1950s, when a number of German goldsmiths explored new possibilities based on values and principles derived from the late-19th century Arts and Crafts Movement. These trends are still continuing in 2015, and have led to the use of a wider range of unusual materials such as graffiti, recycled wood, plastic, rubber, paper and charcoal in jewellery. Such changes have given jewellery a new meaning: the objective is often no longer to create something that is beautiful or decorative, but to make a social or political statement or express a personal feeling. New generations of jewellery artists have found a new design language and a new, powerful voice, and have taken up old artisanal techniques that had seemed to be faced with extinction in the 20th century. "Tore Svensson taught me not to stop until I was satisfied with the form"
Since Lena Olson graduated in 1996, she has run the Hnoss Gallery since 1997, with a group of local jewellery artists from Gothenburg, including her former professor, Tore Svensson, who has a worldwide reputation. 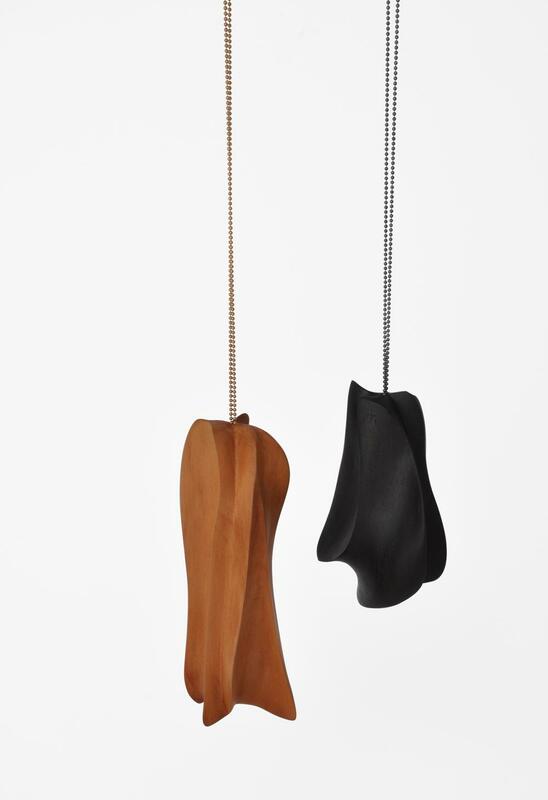 In 2012, Svensson won the 2012 Herbert-Hofmann Prize, a prize awarded annually to the best entries to the special SCHMUCK show at the international Hand Craft Fair in Munich. The Hnoss Gallery was a non-profit organization, which was mainly engaged in the promotion of international jewellery and organizing exhibitions of the work of the best jewellery artists of our time. In the autumn of 2011, despite hosting some beautiful exhibitions, the gallery had to close. From now on, working under the name of Hnoss Initiative, the activities have changed into more curatorial and seminar/workshop-based projects and commissions. Lena Olson, who graduated with two degrees, learnt a lot from Tore Svensson and still enjoys working with him: "Tore is a renowned Swedish jewellery artist and he makes really beautiful things. Ever since I graduated, we have been colleagues. We meet a lot and still have artistic discussions. The thing he especially taught me was to be careful with the material and not to stop until I was really satisfied with the form. He was a real perfectionist and encouraged me a lot. At the time I was the only student who was working in wood. I had two other teachers at University: Christer Jonsson, who taught me a lot about the symbolic and historical values regarding jewellery and also Mona Wallström who introduced me to new materials and taught me what they communicate." 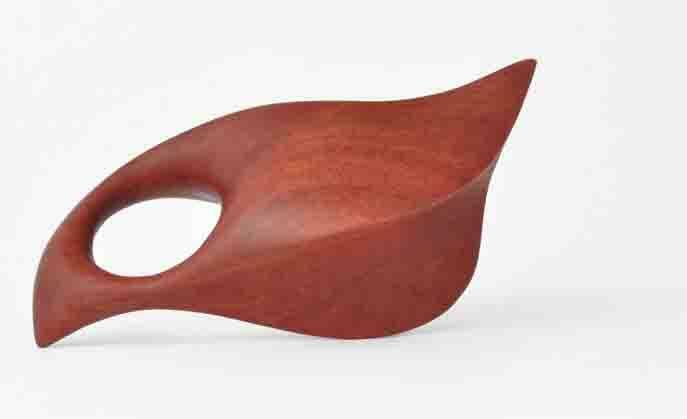 Lena Olson has always concentrated on wood, which is her favourite material. She says that, since her childhood, she always had a close relationship with wood. "That, I believe made it easy and very natural for me to 'add in' my art." Initially she used to combine wood with silver in her jewellery, and also other materials like textiles and concrete. "But wood gave me all the challenges and answers I could ask for. As wood is a material with its own life, with grains and cracks, it adds something to the process. 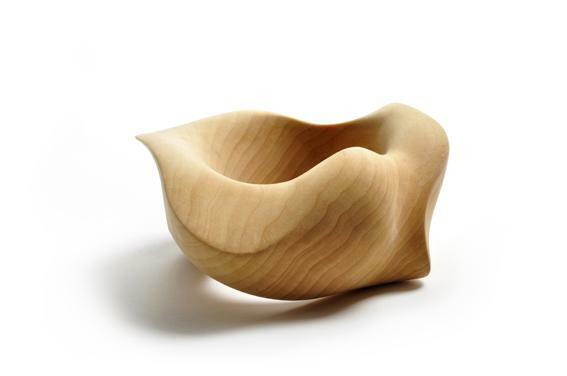 Wood also has a temperature and tactile texture that attracts me." Lena Olson lives in Gothenburg and doesn't exactly come from an artistic family, her parents both being engineers. Her mother had a great interest in working with textile craft and design in her spare time, which was an inspiration to Lena. Both her parents encouraged her a lot. "I was always drawing and looking at art, when I was young. I also loved nature and being together with animals. When I was 12, a friend of my mother, who knew I wanted to be an artist, suggested that I should be a silversmith. I had not really thought about that, but when she said that to me it seemed like a ray of sunshine. I was already studying art as a child and I had art schools in my mind all the time. And then I thought jewellery could be a good possibility." "Gradually I made myself at home in the jewellery world." "I was more into sculpture and other art forms, but the size of jewellery and the hard materials really attracted me. And I thought that jewellery was a nice way of communicating. So I decided to study jewellery art for 5 years at the Jewellery Department of the University. I had to learn a lot of techniques, but the making of jewels, was great. Gradually I made myself at home in the jewellery world. My jewellery reflects a lot of memories of when I was young. I always went to play in the woods when I was young. For me, the wood is very much a part of myself, and there are a lot of woods in Sweden. I think it is a kind of tradition and part of the history for the Swedes. The Swedes are born with wood, we have wood craft in schools, everywhere. Wood is the most common material and I enjoy lifting it up from an 'every-day' material status. I want to make it precious and visual in another way. And wood is an important material for me, and something which is very close to me. You just reach out and you can almost make everything with it. The more you explore with the material, the more you get out of it." In 2014 Lena Olson presented her show "Close to Me", at Platina in Stockholm. This was the culmination of a year-long research project where she examined the placement of jewellery on the body as a physical place. Lena: "The exhibition Close to me presented my results of a year's research within the framework of the craft department at Konstfack in Stockholm. 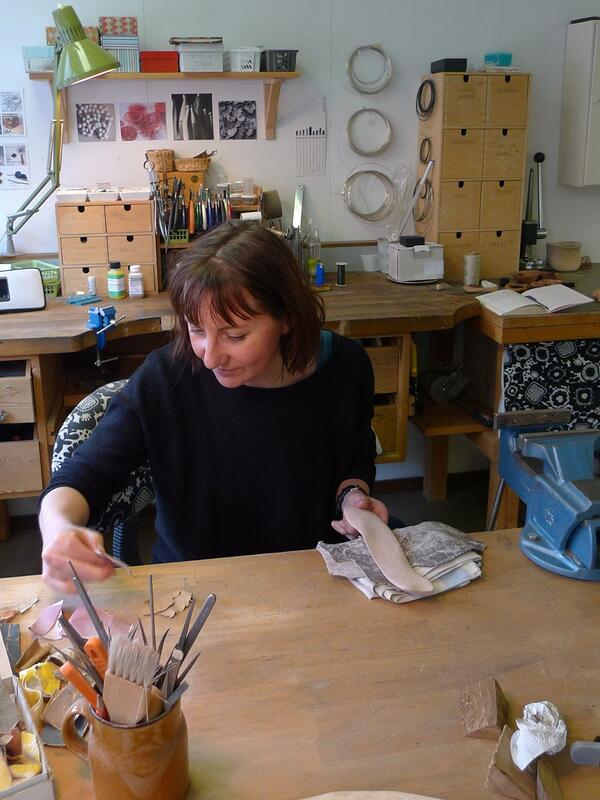 In my project, I have dealt with many aspects of the personal relationship that I, as a jewellery artist,have created between the pieces of jewellery we wear and the human body. The pieces were all worked in wood, closely connected to the body, and wearable in different ways." Lena also teaches at HDK in Gothenburg. Lena: "I try to encourage my students not to be afraid to make mistakes. And then we have discussions and try to look at potential answers to any problems they may have."